This page was becoming cumbersome so I have split it into several pages. Pointing at the Cable Knitting Resources tab above will open a menu listing all the sub-pages. There is also a list of all pages in the sidebar below the pattern pictures. This is an ongoing project, listing resources for Cable, Aran, Irish, Gansey and Bayerische (Bavarian/Austrian/German twisted stitch motifs) Knitting. Please feel free to leave a comment with resources that could be included. 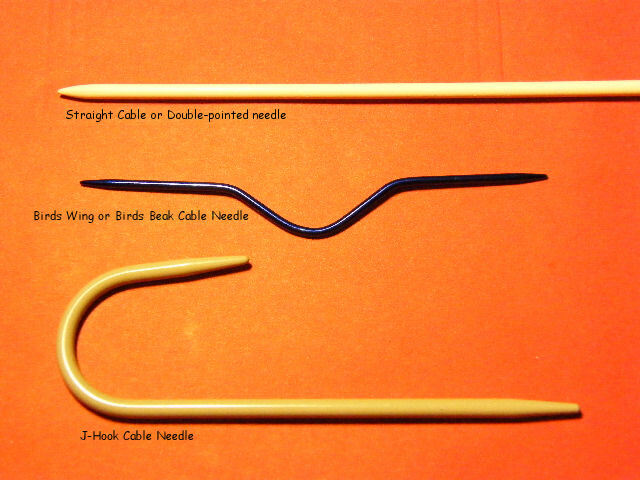 Shown here are the 3 main types of cable needles. Cable needles do come in different sizes (thicknesses) to accommodate working with varying types of yarns. Which type of needle is used is entirely personal preference; they all do the same job i.e. they hold some stitches out of the way while other stitches are worked. The size of the needle should be the same or slightly smaller than your working needle — if it’s too thin, the needle will slip out all the time and that becomes very frustrating — if it’s too thick, it will stretch the stitches. If you’d like to contribute, there’s the Walker Treasury Project. Sign up to knit current swatches of the stitches from the Barbara Walker Stitch Dictionaries. Patterns are not posted online, only pictures and references. Note: links are provided for informational purposes only and are not to be construed as an endorsement of any specific product, company or service unless specifically stated.